Don’t Save a JPEG File Twice! Why does a JPEG still look good, even though it is compressed at least 4:1 (25% of data left)? The reason is that a human is much more sensitive to brightness changes than color changes. While we can see color changes—where one shade changes gradually into another—we are much more sensitive to brightness levels. Therefore, a compression algorithm, such as JPEG, can throw away 75% of the image color gradations as long as the brightness is not affected, and we won’t see the difference. As a test, I took a nice JPEG image and resaved it several times (figure 1). The original is on the left (one save) and the resaved version is on the right (multiple saves). Often one cannot clearly see the changes in a JPEG file until it gets to ridiculous levels like this. The image simply looks bad for some reason that you can’t put your finger on. 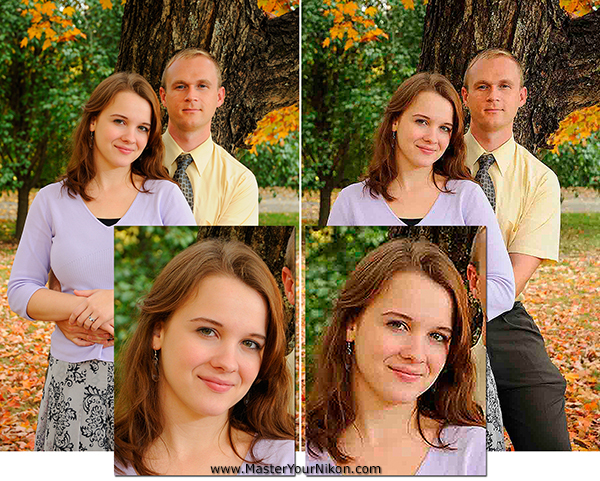 The picture on the right is the result of saving too many times and the resulting resharpening and compression losses. Postprocessing an image should not be done with a JPEG file. The JPEG conversion is the last step in postprocessing. You postprocess a NEF (RAW) file and when you have it just right, save the NEF first, then convert it to JPG for image use. When you save a NEF file, with changes, it does not affect the image data within the file in any way. It affects only the settings markers that are saved separately from the image data (white balance, Picture Control, color space, Active D-Lighting settings, etc.). You can save a NEF file 10,000 times and never change the actual image data. On the other hand, a JPEG is a final product, not meant to be touched again. Do not modify and resave a JPEG. If you didn’t get it right the first time, shoot it again. If you absolutely have no way to reshoot the JPEG and must postprocess it, do not postprocess it as a JPEG. Convert it to a TIFF file first. A TIFF file is not lossy (has no compression, which is one reason they are so big), therefore, you can save and resave a TIFF file over and over without recompressing the file and damaging it. When you are done postprocessing the TIFF file, resave it as a final JPEG. Some postprocessing software does not resave the entire JPEG file. Instead, it saves just the pixel blocks within the file that have been modified. You can get away with a little more postprocessing on a JPEG file with that type of program. However, are you sure your postprocessing software recompresses only the changes and not the whole image, reducing its quality. The moral of the story … Don’t resave JPEG files! Interestign article, Darrell…Thank you for your expert advice on jpeg processing! I usually shoot Raw+JPEG so that I always have the Raw file to work with for commercial use. I find the quality I get from my jpegs (using a D5300, good quality NIkkor optics, and good exposure technique) to be high enough for the relatively low resolution of web images. For making very large prints (20×30 and up), I will use the Raw file processed as a Tif. Thank you, sir! I am always sad and glad when I read about another photographer who either doesn’t shoot raw or thinks raw is just for big prints. I am sad, because I know that a photographer can produce better images small or large for web or for printing, developing a raw file himself with computer and software available today (e.g. LR) that surpasses what a camera’s computer will produce; and I am glad because this is my competition. Also, I was very glad that you addressed the subject of saving a jpeg. I just got home from a “camera club” where the vice president of the club as well as speaker gave a presentation on Camera Raw, and instructed the class that jpegs could be saved multiple times (and yes, changed each time to suit his new vision). I tactfully asked for a clarification since I was pretty sure I read somewhere that saving a lossy file like jpeg multiple times (after working on the files) could leave to a pixelated image. I was told by the speaker I was wrong in my thinking, and the president of the club agreed. I felt bad for the newbees who were taking notes.